Chicago Bicycle Accident Lawyer | Illinois Bicycle Lawyers at Keating Law Offices: IL Proposes the "Child Bicycle Helmet Safety Law"
IL Proposes the "Child Bicycle Helmet Safety Law"
Illinois House Representative Julie Hamos has introduced a bill that would create the Illinois "Child Bicycle Helmet Safety Law." The Child Bicycle Helmet Safety Law would be an entirely new section in the Illinois Vehicle Code. You can read the entire text of the bill here. This bill would categorically change the requirements for minors (under 18) riding bikes, parents who carry or pull small children while riding, and persons who rent bicycles. Bicyclists Under 18: Minors that either ride a bike or a passenger on a bike are required to wear a "protective bicycle helmet of good fit fastened securely upon the head with the straps of the helmet." Simply put, if you are under 18 and want to be on a bike, you have to wear a bike helmet that meets the requirements of the U.S. Consumer Product Safety Commission or other technical specifications set by ANSI, ASTM or the Snell Memorial Foundation requirements. Babies and Toddlers: The new law would create specific requirements for transporting babies and toddlers. If a parent or other adult rider wants to ride with their baby or toddler as a passenger on their bike, they have to: i) be at least one-year of age and able to sit upright; ii) the parent or adult rider must be seated alone in a saddle seat; or iii) any person under 40 inches in height or less than 40 pounds must be secured to a bicycle safety seat. Civil Penalty: A person who violates the law would be guilty of a civil offense and pay a penalty of not more than $30 including court costs. The bill provides that a first time offender may have the civil penalty waived by the court if they can show proof of purchasing an appropriate bicycle helmet or safety seat. This is similar to the custom and practice for showing proof of insurance for a motor vehicle. Renting Bikes: Anyone renting a bike must have an appropriate bike helmet with them or be able to get one for use while renting the bike. 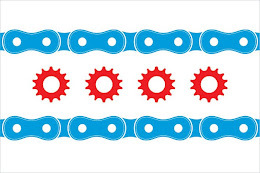 The Illinois "Child Bicycle Helmet Safety Law" is up for hearing before the Vehicles & Safety Committe on Wednesday, March 3, 2010 at 10:00 a.m. in Room 115 of the Capitol Building in Springfield. Senate Bill 6114 is a similar bill currently pending in the Senate and set for hearing on March 2, 2010 in Room 212 of the Capitol Building. These hearings are open to the public and anyone who wishes to testify before the committee may request to do so. If either the House or the Senate bill passes out of committee, it could be called to be heard before the entire House or Senate for debate and a vote. If the bill makes it out of one chamber and is then passed by the other chamber, it would then be put before Governor Quinn for signing into law in Illinois. Gov. Quinn is an avid bicyclist and promoter of pro-bicycle legislation so it is a safe assumption that he will pay careful attention to the Illinois Child Bicycle Helmet Safety Law. In theory, the Illinois Child Bicycle Helmet Safety Law could go into effect this Spring before riding season kicks into high gear.